“Making Peace is more about Spiritual Growth than about conflict. Van Yperen is a skillful writer who argues that conflict in the church is controlled by God to bring about Spiritual Growth and Renewal. 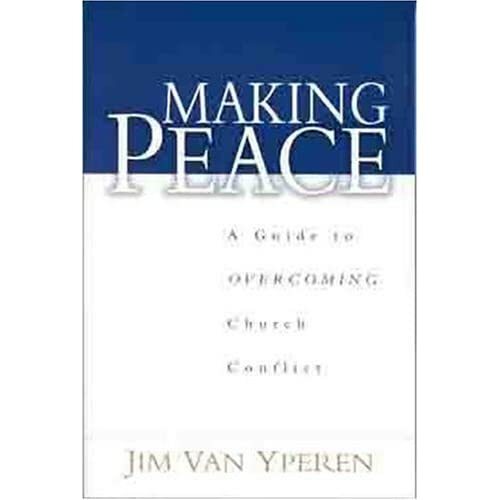 Rather than viewing conflict as the problem, Van Yperen shows that conflict is the vehicle that brings us closer to God and to each other. Word and His People to turn the Devil’s plot of Disruption into Spiritual Victory. The book is a significant blessing to me by pointing out weaknesses in my ministry. I have never questioned my relationship with The Lord, or my confidence in His Word, but I have often demonstrated a lack of faith in His People. This what I gained the most from this book. The Community of Faith is empowered by God to bring about Spiritual Healing by applying biblical principles in conflict. Van Yperen skillfully demonstrates these principles by first showing examples that do not work. He then guides the reader to simple and practical ways of accountability that brings healing and community back to a hurting church.